Over 3,000 attendees showed up to Social Media Marketing World 2017. Chances are, you weren’t one of them. Which means you missed out on the most recent tips and strategies that were shared by the world’s brightest professionals in the industry. Sure, you could jump on the twitter hashtag and analyze the 56,732 tweets and get an idea of what went on…But, who has time for that? I thought I would spare your thumb about 10.5 hours of scrolling and just give you the INSIDE SCOOP with my top 10 takeaways from social media marketing world 2017. Without a doubt, one of my favorite sessions was the opening keynote delivered by Social Media Examiner founder, Michael Stelzner. Facebook is the most important social media channel, even though your content is getting seen less and less as news feeds are getting slammed with content overload. HOWEVER, the algorithm buster is Live video. Facebook is aggressively advertising live video and making it extremely easy for others to see your live videos. 28% of marketers are using live video which has doubled just from last year. Now, 61% of marketers plan on increasing live video use this year! Instagram is the HOTTEST social media platform right now. The slide below paints a solid picture as to how strong Instagram is growing right now. Messenger is the FUTURE. It’s going to be the next big thing in social media marketing so understand it, embrace it, and implement your strategy. I’m a huge podcast junkie. I also record most of our Stukent Expert Sessions and with the popularity of live video, I was attracted to Michael O’Neal’s workshop session on Becoming an Interview Master. It’s all about how your guest feels after the interview. Did they feel like they just punched a time clock and banged out another podcast interview? Or, did you create an experience that was unique to them by asking questions that made them go deep, and that haven’t been asked anywhere else? Be INTERESTED, not INTERESTING on the mic. Make your guest come up with something unique during their introduction by introducing them like a boss. If you say everything they were going to say, then they just might share something unique that has never been shared before except for on YOUR podcast. DO. YOUR. RESEARCH. There are over 566 million visuals shared each day privately on Facebook Messenger! There are over a billion people using Messenger! Why is Facebook investing so much into the Messenger Platform? Marketers can set up bots to communicate and sell directly in Messenger. Michael Stelzner stood on the stage and boldly proclaimed that Facebook Messenger and other messenger apps are a megatrend the next big thing. For social media marketers, the messenger platform is the next frontier. You might be trying really hard to just ignore it because it’s hard to comprehend how a closed, private network could be so powerful, but it is. And, it’s happening right now. Molly Pittman (VP of Marketing at Digital Marketer) delivered an excellent presentation on how businesses can take advantage of Messenger. So I had no idea who this guy Joey Coleman was but customer advocacy was at the top of my list + he was keynoting so I figured I could walk away with a few solids. Joey was dropping wisdom dimes all over the stage. He spoke about how so often we screw everything up within the first 100 days of the customer journey. If you can keep a new customer clear through day 101 then they are likely to stay with you for five years. In terms of building your team, Joey mentioned how crucial it is to hire people that understand the value of EXPERIENCE. Surprise gifting is how you wow your customer. Plan on giving three gifts to your new customer within the first 100 days. After all the talk about live video in Michael Stelzner’s keynote, I made it a point to check out a few live video sessions. Alex Khan did a fantastic job in sharing a ton of actionable tips for better live videos. Here at Stukent, we are doing more and more live videos so I was glued the entire time. If you look around at all of the major social platforms, they are all now pushing their live video function. Well, video is shared and consumed 1200x more than text and images. Live video is shared 3x more than that! Alex talked about 10 things you can start doing to create better live videos. I’m going to share five of my favorite. Secret ninja tip: If you mess up during that first minute, don’t panic. Simply flip the screen and show what you’re looking at – talk about that for a second until you regain your train of thought or composure. When you wrap up your live stream there are a few things you need to do. Alex shared a gnarly strategy – The Code Word Strategy – to increase replay viewers and maximize your watch time. Then tell them that at the end of the stream you will tell them what to do with that code word. Ex: At the end of the live stream you say to your viewers the first three people who tweet the code word to me wins a prize or a shoutout! Let’s assume that you partner up with a company or brand to run a giveaway on your live stream. Make sure you pre-promote the giveaway across all of your channels. You’ll want to add the name of the company or brand to your video title and explain any specific details about participating in the giveaway. Next, make sure people follow you and that the winner has to stay on until the end of the live stream. When it’s time to select the winner, do it live. You can use TweetDraw to randomize the selection. Use Messenger for customer service. Facebook now allows 50 people to be in a single chat. If you can get people to message you, they are more likely to buy from you. Square images and videos perform better on Facebook and Instagram. Retarget people who viewed at least 25% of an existing video. Let Facebook organic work for 24 hours before you boost a post. And of course, content. Create THUMBSTOPPING content. CREATE. THUMBSTOPPING. CONTENT. Great advice from @MariSmith! A video view on Facebook is only counted after three seconds of watch time. If you can get a 30-second video view, you’ve hit a homerun. Make sure you pin your top video to your Facebook feed. If you have a video post with Tai Lopez, boost the post to Tai’s audience, your views/engagement should be high and validate the post. Then, switch the boost to your mega-media inception custom audience. Instead of writing an article on your own blog about affiliate marketing, go write it on a blog that is much more influential than your own. Then, boost that post! People will see you as more of an authority by connecting you with said influential blog. If you aren’t familiar with Larry, he loves unicorns in every way possible. So it was fitting for him to talk about finding unicorns and going all in on promoting them. Larry shared 10 social advertising hacks for 2017. These are content pieces that already have really high engagement rates. Usually, your top 1-3% producing content. Go into your post analytics and sort by what has the most engagement. There will probably only be a handful of posts that have an engagement rate of over 10%. Those are your unicorns. A unicorn baby is simply taking something that excelled somewhere else (was a unicorn) and duplicating it on another channel or platform. Guest blogging – if it performed well on your site, it will perform just as good on someone else’s. Take the topic that excelled and fully explore it/go into greater depth. If the article was about five things you need to know about Google maps, take each one of those five and write their own blog post. Turn blog posts into a webinar, or a Slideshare, or video, etc. Precise ad targeting drastically boosts your relevancy and can make boring stuff seem not boring by targeting a super niche demographic. Remarketing lists for search ads (RLSA) function differently than your normal PPC search ad. It combines your remarketing list from your website + keywords you want to target. So when someone visits your drone website, then goes over to Google and types in “best drone reviews”, your ad will be shown to them(assuming you are targeting “best drone reviews” keyword). Your click through rate is through the roof because they have heard of you. Oh, geez. Thanks for that tip, chief! So, what is good content and how can you create it consistently? I attended a couple sessions about just this. Ann Hadley from MarketingProfs was solid as well as Heidi Cohen. Both delivered exceptional content. Consistency: Heidi says it takes 52 articles (or about 30 months) before you start seeing traction in search engines. Once you get to over 450 posts, you’ll notice your traffic double. YOU: Always write in 2nd person. Data: Including data analysis drives article views. Aaron Orendorff: Follow Aaron’s blog and read anything you can from him. Pinpoint the one key point you want the reader to engulf. Everything else should revolve around that. Lead with your absolute best bits. Your readers are looking for reasons NOT to read your content. For anyone who has worked with me over the last 3 – 4 years (or my wife) knows that I kind of, sort of, have a fan-girl crush on Pat Flynn – host of the Smart Passive Income Podcast. I stumbled upon him about four years ago. He was actually the first real podcast that I listened to and it happened to be during a time when we were getting ready to sell our family business of more than 25 years and I was trying to validate different career paths. Randomly caught Pat in the hall by himself before he was starting a live video. I strongly suggest that you subscribe to his podcast/everything else he does if only to see how he manages to be everywhere at once and building a loyal gigantic following. Anyways, of course, I was going to sit in on his session at SMMW17. Pat shared 10 tips to create a hit podcast episode. Since I don’t host my own podcast I chose to broaden the scope here and apply these tips to creating content in general. This is not new, at all. I’ve always thought of the roundup post as a Q&A style post or a list all laid out in words. Pat uses a tool called SpeakPipe.com to make it easy for people to record answers or comments verbally. Being able to add the influencers own voice to your content will take it up a few notches. Plus, you can always transcribe the audio file to build out your blog post. What’s a quick way to get your content in front of a ton of people (probably for free)? Interview the owner of a large forum within your niche. Chances are, once you’ve published that piece of content and shared it with the forum owner, he/she will distribute that down through the forum where a huge audience awaits. This one takes a bit of planning but if done right can be a huge value piece. If you’re in the outdoor space, you could do a 3-part series on how to tie the best spring fly-fishing fly. You would publish them all at once – hence, the BURST strategy. If the content is exceptional, you create the opportunity to be known as the person that has that awesome 3-part series on tying spring fly-fishing flies. Lee Odden shared his knowledge and expertise on building influencer marketing programs within an organization. Influencer marketing develops relationships with industry experts with active markets to co-create content that helps drive business goals. Lee and his team have done a ton of research on this and it can be found here. $9.60 earned media value for every $1 spent. 82% of consumers will follow recommendations from influencers. You can see upwards of a 10x increase in conversion rates when you work with influencers. Influencer content generates a 37% higher retention rate. It’s a lot cheaper to keep your customers than to go out and get new ones all of the time. Across the board, influencer marketing is underfunded, BUT, 55% of businesses plan on increasing their marketing towards it. Instead of thinking of what the cost might be to bring on tier 1 influencers, think about what that cost might be if your competitor picks up that influencer. Start an influencer program, not a project. If the influencer sees how much you care about them, they are more likely to promote your brand with greater passion/frequency. Make sure your program is tied back to something measurable that makes it easy to see how you will make money. Activate the low hanging fruit. Reach out to those who are already talking about you, even if they aren’t top-tier influencers. Identify your brand influencers, reach out to them to get a quote or snippet that you can use in your own branded content piece. This gets you on their radar and adds value to your content piece. You could also do the same type of thing with a post full of tips, or do an in-depth interview with them that is an extension to some other broadcast they’ve done somewhere else. I just shared a TON of tips and actionable information from some of the industry’s best social media marketers/brilliant minds. What’s the #1 thing you are going to go do now? 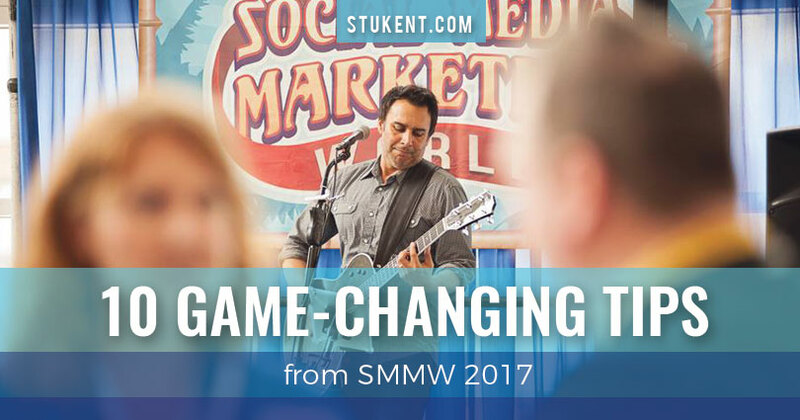 Did you also attend SMMW17? If so, what was a key takeaway for you? Tweet me (@t_erikson) or let me know in the comments! Vice President, Stukent, Inc. at Stukent, Inc. I'm from Idaho, best place ever. Currently working the pavement on our ed-tech startup - Stukent, Inc. Follow me through my social media channels to see what keeps me busy.